The poultry value chain in Africa, Caribbean and the Pacific (ACP) countries involves both large-scale integrated enterprises and small-scale production systems. The former have benefited from capital investments, access to information and scientific research, whereas the latter remain isolated despite their significance. 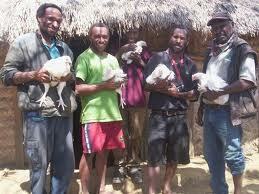 Family poultry comprises approximately 80% of the world's total poultry stock and plays a key role in many households in ACP countries for food and nutrition security, livelihoods and conservation of indigenous breeds. An analysis of the family poultry value chain, including its poor productivity and low financial and technical inputs, shows that it contrasts markedly with conditions in large-scale commercial poultry enterprises. Governments and researchers would be well advised to thoroughly review the family poultry value chains to identify priorities for science and innovation that can contribute to improved efficiency for the provision of eggs, live birds, fresh-chilled, frozen and other value-added poultry products. This summary is provided by CABI and CTA, July 2012.